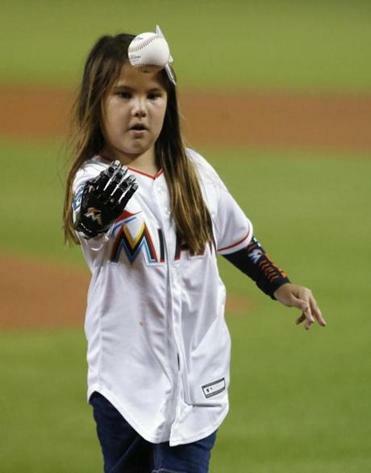 Hailey Dawson, 8, uses her 3-D printed robotic hand to throw out the first pitch before a baseball game in Miami on Aug. 10. These haven’t been the best weeks for additive manufacturing. Or as the rest of us have already grown fond of calling it, 3-D printing. After nearly a decade hovering atop a cloud of promise on the horizon, 3-D printing is slowly making a place for itself in the mainstream. Like virtual reality, 3-D printing has existed as an idea waiting for the technology to catch up with it; so most of what consumers have seen squirting out from the first wave of these cumbersome, expensive, and pokey machines has been in the form of trinkets, doodads, toys, and more fractal-inspired jewelry than your hippie aunt has room for. But the technology is getting slightly more affordable and a lot more versatile. We won’t see a boom in 3-D printers for the home, but there’s an ongoing surge in development of 3-D fabricators for small businesses. The MIT Media Lab-spawned company Formlabs — which sells the Form 2 (“a complete stereolithography ecosystem”) for less than $3,350 — just announced $15 million in fresh funding, bringing its valuation to over $1 billion, according to Quartz. And as the means for consumer-level 3-D printing become more accessible and as the technology refines itself and the range of printable materials broadens past cheap polymers and plastics, the more serious implications surrounding the spread of 3-D printing are starting to become more legible at large. Most notably, this has come up in the surge of discussions around 3-D-printed firearms, freshly injected into the national conversation after Austin, Texas-based gun access activist Cody Wilson and his company Defense Distributed announced plans to publish blueprint plans for a 3-D-printable handgun. The specter of a printable firearm has been floating around for a while, but the shabbiness of the available materials often meant a gun that would crack in half from firing. These more sophisticated plans plus improved technology in 3-D printing produce a gun that not only fires effectively, but that cannot be traced or detectives detected. A federal judge issued an order to block the release of the plans, and here at home, Attorney General Maura Healey has stated in no uncertain terms that 3-D printed guns are illegal under state law. But these gestures ring helplessly symbolic — like a bell that’s released its toll. Any attempt to stop the flow of printable firearms, especially through legislation this late in the game, would be about as effective as firing a pistol into an approaching flood. Naturally, this debacle has led to a far more anguished discussion over the pending perils of 3-D printing than toward any meaningful discussion about gun regulation. But before 3-D printing gets fabricated as some dark technology, it’s worth considering the many ways this soon-to-be-ubiquitous technology stands to benefit those of us who would like to see civilized society continue, tacky jewelry and all. Or take the Burlington-based Desktop Metal , which Wired recently referred to in a profile as helping along “another industrial revolution” with its metal printing technology, which could quickly upgrade 3-D printing’s usefulness from rapid prototypes and wonky one-offs to a complete redefinition of what mass production looks like — and what it costs: a “Studio” printer goes for $120,000; a “Production” model for a quarter mil. But the biggest impact of 3-D printing may be in medicine, where it could hyper-personalize the way care and treatments are administered. It’s also being used by doctors at Stanford to produce cardio catheter devices for heart patients, printed to “replicate that natural geometry and anatomy specific to that patient,” by researchers at NYU to grow bone tissue, and by scientists in Vienna to create “organoids” — three-dimensional models of organs (even placentas). Technically, the less these last few technologies enter your life, the better. But let’s be careful not to let our worst instincts and deepest fears give a menacing shape to a technology that could actually be a life saver. As for the hazards, we may be stuck with them — at least until we figure out how to print common sense.